To explore the history of the lead screw we need to go back to ancient Greece and the invention of the screw. A screw is known as a device that converts rotational motion into linear motion and also converts rotational force (torque) into a linear force. The most common form of screw consists of a cylindrical shaft with helical ridges called threads. The screw passes through a hole in another object that often has threads on the inside of the hole that mesh with the screw’s threads. In screw mechanisms, either the screw shaft rotates through a threaded hole in a stationary object, or a threaded collar, such as a nut can rotate around a stationary screw shaft. Some experts credit Greek mathematician and engineer Archimedes with inventing the screw. Others say it was Archytas of Tarentum. In ancient times, the screw was primarily used in screw presses to magnify force. Screw presses were large machines that were typically turned by men or oxen. 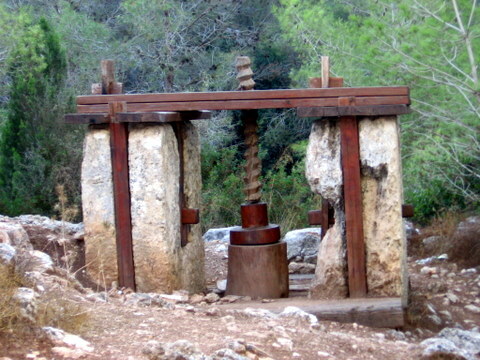 Screw presses were typically used for squeezing juice from grapes and oil from olives. The Greeks credit Archimedes with inventing the Archimedes screw water pump around 234 BC. However, The Encyclopedia Britannica says there is also evidence of a similar device being used prior to that time in ancient Egypt. Crude screw-cutting lathes were developed around the 15th century. That’s when screws started to become more widely used as fasteners, drills and augers. Around 1750, Antoine Thiout introduced the innovation of equipping a lathe with a screw drive. This allowed the tool carriage to move longitudinally. In 1770, Jesse Ramsden developed a relatively precise screw-cutting lathe. Using his lathes, a long screw could be cut from a small original screw. Precision screws were crucial to the development of precision instruments used in the construction of steam engines and other machines. A lead screw, also known as a power screw or translation screw, is a screw shaft that rotates causing a nut to move linearly along the shaft. It’s difficult to pinpoint when lead screws were first invented because you could say that the original grape and olive presses were a form of lead screw. Lead screws have also been used for many years in various types of vises, jacks, and machine slides. Herman R. Noll became part of lead screw history when he established the original Noll Facility in 1956. Noll helped introduce thread rolling to Southern California, mostly for the aircraft and aerospace manufacturing industry. In the early days, Noll primarily produced aircraft threaded inserts that allowed bolts to hold torque in components made of aluminum and other alloys. In 1960 Noll moved his manufacturing facility to San Luis Obispo to be closer to the rising microwave industry in Silicon Valley. Microwaves were increasingly being used in communication, medical devices, and lasers. These devices required ultra-fine pitch tuning screws for adjusting frequency. In the mid 1970’s to the mid 1980s, Noll also provided lead screws for office product and printer companies such as Hewlett Packard and IBM. By 1992 at the infancy of the biomedical industry, lead screws required even more precision and demands on tolerances. Noll began merging the screws and plastics together to offer turnkey subassemblies that required 0 defects and 100% reliability.